You walk into their house and hand them your bottle of wine🍷. You then turn around and see that the other two guests each hand bottles of wine to the hostess as well!! SOUND FAMILIAR?? THIS ENDS NOW!! Come and get candy, chocolate, and fruit for all of your needs! We have the hard-to-get candy with a constant change in variety! Not only will your tray be an exciting change, it will be a guaranteed non-recyclable host gift! Majority of the trays can be reused for other purposes and will be a memento that lasts forever! Beautiful platters and trays for Shabbos, Simchot, Chagim, dessert, sleeping hosts and much more!! The variety of candy/chocolate/fruit that you see in the following pictures will change from time to time. When ordering, please give advance notice. 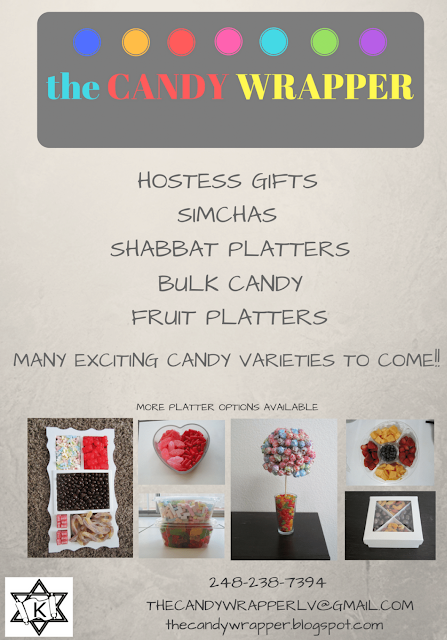 The Candy Wrapper is under the certification of the Ahavas Torah Center in Henderson, NV.